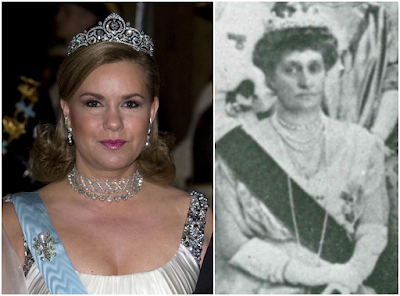 The Belgian Scroll Tiara vs. Queen Victoria Eugenia's Aquamarine Tiara. 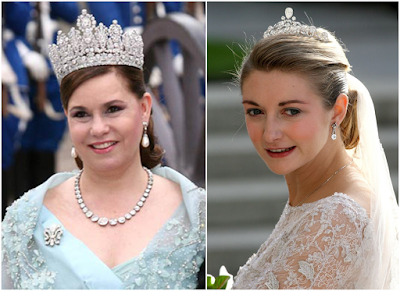 A former wedding tiara that has been worn by three Grand Ducal ladies thus far against the only tiara featuring coloured stones left in the race and at the same time showing just how royal the ancestry of Princess Sibilla is. I know it's getting tougher and tougher but tell us nonetheless, which one is your favourite? Voting closes on Sunday night. On Tuesday evening, Hereditary Grand Duke Guillaume and Hereditary Grand Duchess Stéphanie were in Brussels to attend a concert at BOZAR (the city's Center for Fine Arts). The event, entitled "United Instruments of Lucilin," was directed by Pascal Schumacher (the jazz musician from Luxembourg) and Christian Schumann (the symphony conductor from Germany). The program also included a presentation of Luxembourgish artist Tina Gillen's exhibit ECHO. Minister of Culture Maggy Nagel attended with the Hereditary Grand Ducal couple. 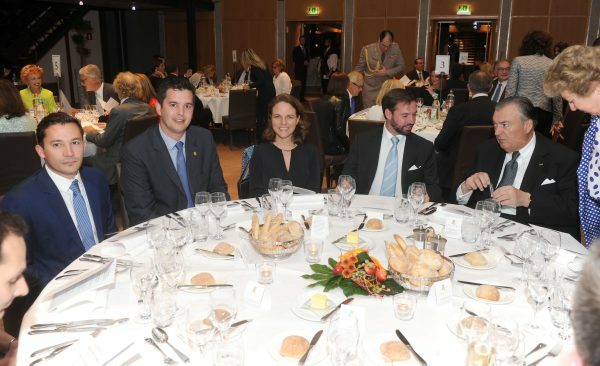 This event was organized in connection with Luxembourg's current role as President of the Council of the European Union. Still awaiting photos, but they'll be added as soon as they show up. Pictures now at the cour. Today, Grand Duke Henri and Grand Duchess Maria Teresa are in Strasbourg to attend a plenary session for the Council of Europe. 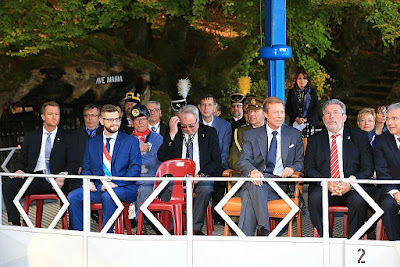 The Grand Ducal couple attend at the invitation of Luxembourg native Anne Brasseur, current President of the Parliamentary Assembly of the Council of Europe, and Grand Duke Henri also delivered a speech during the session. His speech included comments on the refugee crisis, with the statement: "This crisis is a great touchstone of our ability to show solidarity in Europe and remain true to our common heritage," and he continued by encouraging the pursuit of a common solution: "It is in times of difficulty and crisis that we have to stand together and show that what unites us is much more important than what divides us...Fear of the unfamiliar is the worst enemy." The event will also include a presentation about Belval and the ongoing efforts there to reclaim the land and turn it into a safe, usable, and prosperous space for the future. 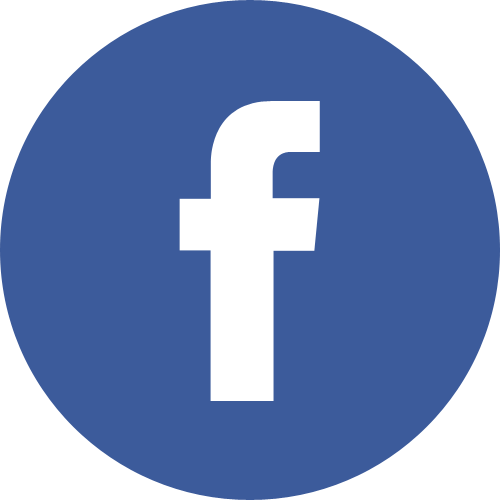 While in attendance at the Council of Europe meeting, the Grand Duke and Grand Duchess will also meet with Secretary General Thorbjorn Jagland, Congress President Jean-Claude Frécon, Commissioner for Human Rights Nils Muiznieks, and President of the European Court of Human Rights Dean Spielmann. Grand Duke Henri's speech available from RTL, plus some question-answer session (with a response about monarchy), also from RTL. 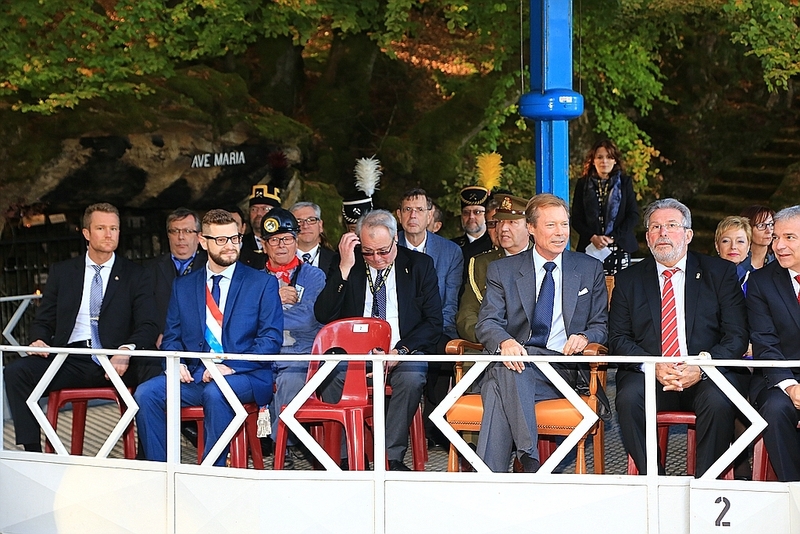 On Sunday, Grand Duke Henri was in Kayl to attend an official ceremony for the 30th international day of miners. The site of the ceremony, known as Léiffrächen, is a monument to the miners who died there: a group of slates lists out the names of each worker, and a cave with a statue of the Virgin Mary is nearby. Also in attendance were miners from the Bois du Cazier in Belgium. No photos of the event at present, but they'll be added if and when they become available. Thanks to the reader who found them! More from RTL. Also, a lovely photo from Revue (scroll down). Voting closes on Wednesday night. Already on Friday night, Hereditary Grand Duke Guillaume and possibly Hereditary Grand Duchess Stéphanie were present for a gala dinner in favour of the Fondation Kräizbierg in Mondorf-les-Bains. I say possibly as we don't have pictures of the event yet and only Guillaume is mentioned on the official agenda but I recall this being the case in previous years and Stéphanie still accompanying him. 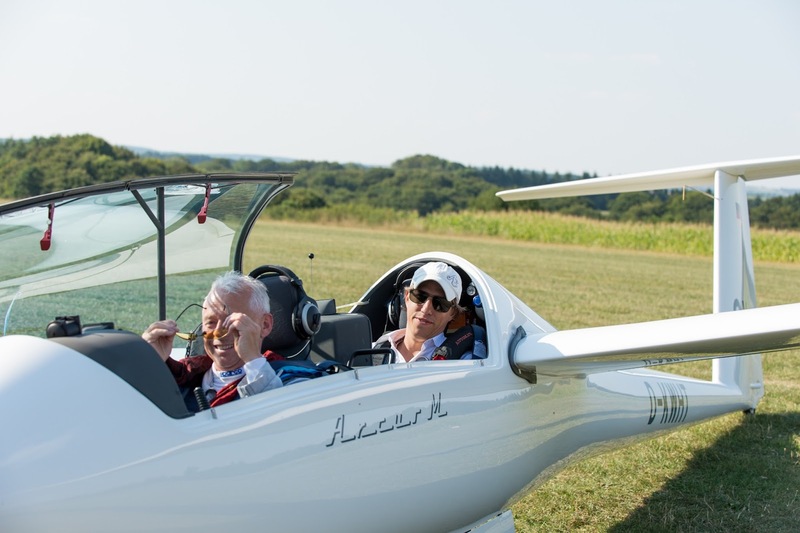 The Hereditary Grand Duke has been long involved with the foundation that helps to integrate people with handicaps into society and the job market. He became the Fondation Kräizbierg's honorary president in March 2011 after serving as its actual president for more than ten years. If pictures become available we will add them to this post so make sure to check back later on! One of the lesser known faces of the Princely Family seems to slowly but steadily become one of the better known faces of the Princely Family: Princess Theodora, granddaughter of Prince Philipp, her mother Princess Astrid and her maternal grandmother Ingrid Kohl visited the Expo 2015 in Milan today. The trio paid visits to the pavilions of Japan, Switzerland, the United Arab Emirates and Italy. Liechtenstein does not participate in this year's universal exhibition, which is held under the motto "Feeding the Planet, Energy for Life" and thus totally in line with all the other events we have seen Theodora attending during the past year or so since launching the Green Teen Team. 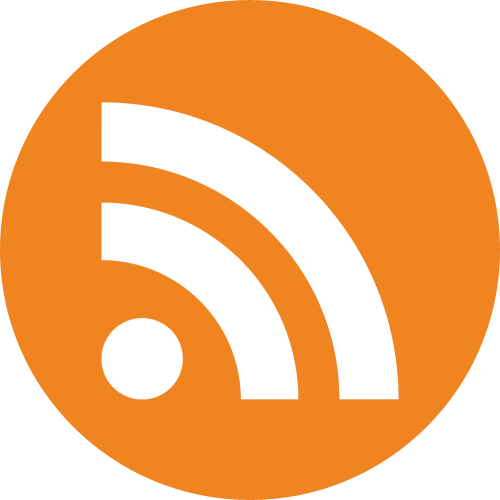 More information, quotes and pictures of today at Verese News. Last night, Grand Duke Henri was among the guests for the inaugural concert of the new chief conductor of the Orchestre Philharmonique du Luxembourg, Gustavo Gimeno. He succeeds Emmanuel Krivine, who was was the music director of the Grand Duchy's philharmonic orchestra from 2006 to 2015. For Gimeno's first concert Mahlers Symphony No. 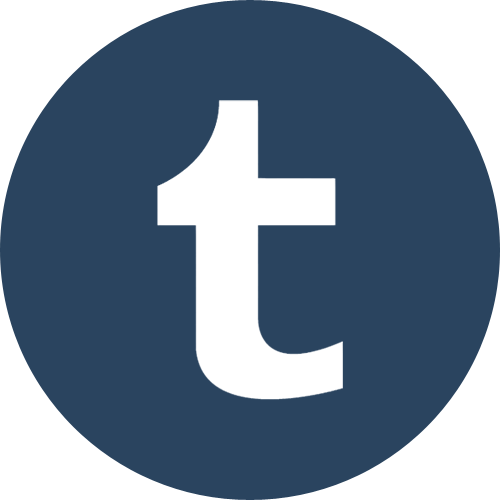 1 ("Titan") was played. 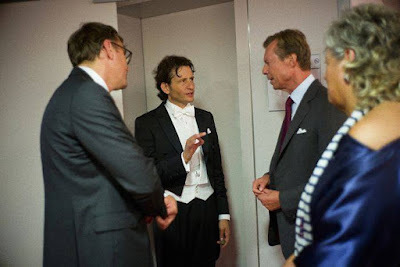 We haven't seen any pictures of the Grand Duke at the concert thus far but will add them if we do. 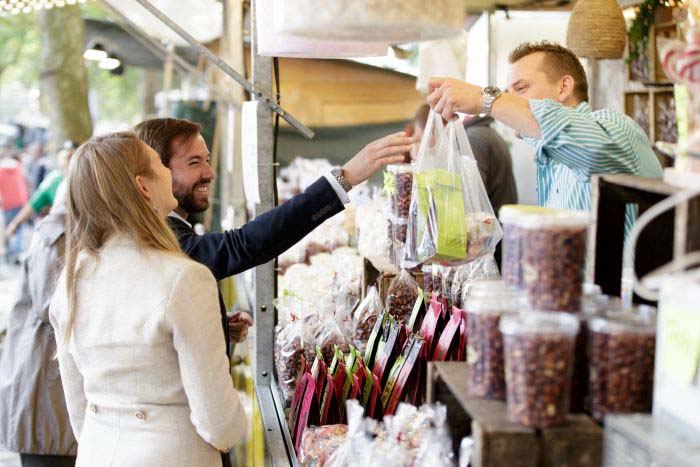 On Thursday, Hereditary Grand Duke Guillaume and Hereditary Grand Duchess Stéphanie visited the market garden Neien Duderhaf, which has been owned by the Kirsch family for four generations. The couple was invited to the tour of the integrated production vegetable producer by the Fédération Horticole Luxembourgeoise and accompanied by Fernand Etgen, the Grand Duchy's Minister of Agriculture, Viticulture and Consumer Protection. No pictures seem to be available yet but will be added if they do. There's one at L'essentiel now. 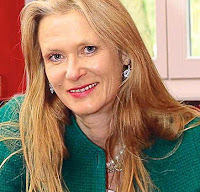 The Duchess of Croÿ, née Countess Alexandra Miloradovich, died on Wednesday, September 23, after a severe illness at the age of 55. She was married to Duke Rudolph of Croÿ, grandson of Princess Antonia of Luxembourg, the last Crown Princess of Bavaria. Together with her husband, Duchess Alexandra was a regular at big family gatherings of the Grand Ducal Family such as the weddings of Hereditary Grand Duke Guillaume and Archduke Christoph. She leaves behind her husband and their six children, Carl-Philipp, Xenia, Marc, Heinrich, Alexander and Anastasia. Our thoughts go out to them. The requiem for the Duchess will take place on October 3 near Dülmen, Germany. Edited to add: Grand Duke Henri and Grand Duchess Maria Teresa, Prince Louis and Princess Tessy, Princess Alexandra, Prince Jean and Countess Diane with two of his sons, Archduchess Marie-Astrid and Archduke Carl-Christian as well as their children Archduchess Marie-Christine, Archduke Imre, Archduke Alexander and Archduchess Gabriella were among the mourners at the funeral. On Wednesday, Grand Duke Henri opened the long awaited A7 North. The section of highway has been under construction for what some would consider a lifetime and was the subject of many protests over the years. The section of roadway opened by The Grand Duke is an 8.5km section of road and tunnel that links Kirchberg to the main section of the highway in Lorentzweiler. More pictures and a video at Wort. 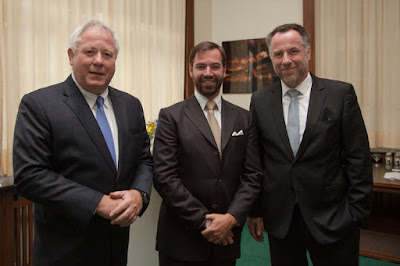 Hereditary Grand Duke Guillaume Attends "Private Wealth Seminar"
On Wednesday, Hereditary Grand Duke Guillaume attended the "Private Wealth Seminar," held at Philharmonie Luxembourg. Colombian-born politician, activist, and writer Ingrid Betancourt was there as a speaker (after her audience with Grand Duke Henri earlier in the day), and Minister of Finance Pierre Gramegna was also in attendance. No photos from the event yet, but they'll be posted if they're made available. It's already Thursday at noon (at least in the time zone I'm in) and so it's high time for the third quarter final of the Luxarazzi Tiara Race. But first, let's have a look back how the last match turned out. It wasn't as close as the one before but I still think that Princess Joan's Diamond Tiara went remarkably far for it's little known history and wearer. However, in the end it was no match for Queen Victoria Eugenia's Aquamarine Tiara which gathered about two thirds of your votes. 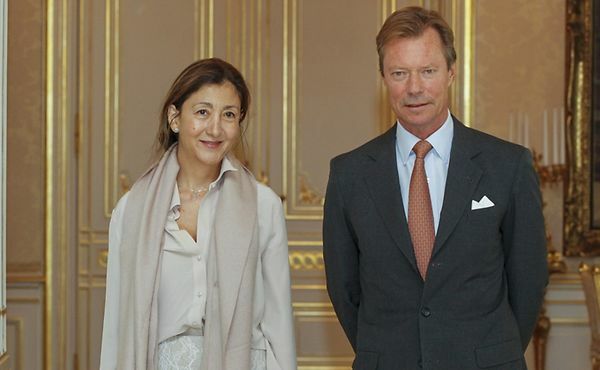 Today Grand Duke Henri received in audience Ingrid Betancourt, the anti-corruption activist and former presidential candidate from Colombia. Betancourt endured a grueling six-year captivity after being kidnapped by a rebel group in 2002, while she was running for president; she was one of 15 hostages eventually rescued in 2008. Since that time, Betancourt has retired from politics and now focuses on writing and supporting causes that fight international corruption. Later this evening, Betancourt will speak at the Private Wealth Seminar, which Hereditary Grand Duke Guillaume is also expected to attend. More information about Ingrid Betancourt, her past experiences and ongoing accomplishments, and her visit to Luxembourg at Wort. 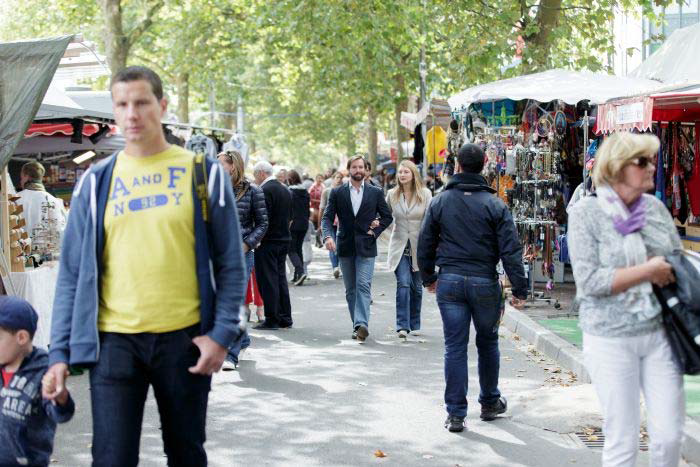 Also, a bigger photo at the Cour website. On Saturday, Prince Louis, together with his wife and children, attended a private event at the Useldange Airport at the invitation of the Cercle Luxembourgeois de Vol à Voile. 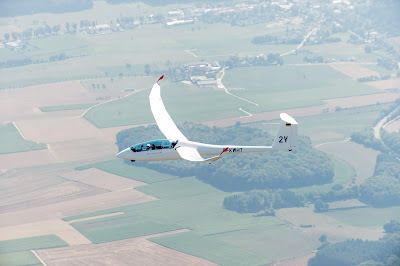 Prince Louis, as president of the Fédération Aéronautique Luxembourgeoise and as a qualified pilot, was invited to make a 144km flight in a high performance glider accompanied by record holding pilot Guy Bechtold. 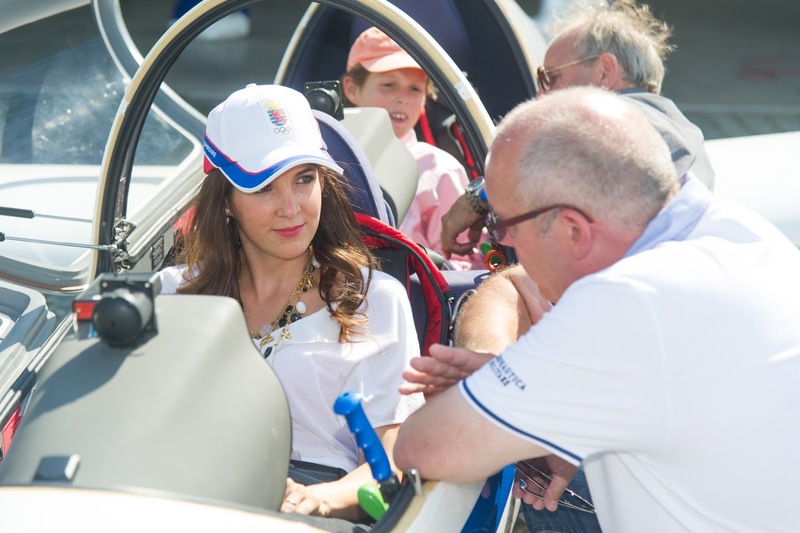 Princess Tessy, Prince Gabriel and Prince Noah each had the opportunity to learn more about gliding and aeronautics. 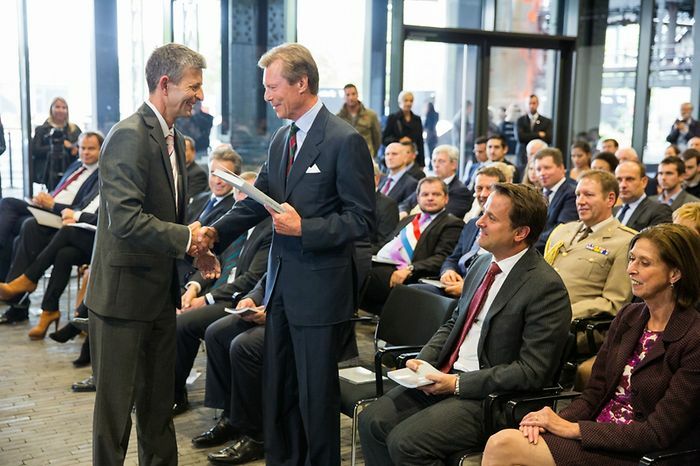 Grand Duke Henri was at the University of Luxembourg's Belval Campus today for the inauguration of three new buildings: the Maison du Savoir, the Maison des Sciences Humaines, and the Maison de l'Innovation. The new construction was first envisioned in 2001, with the Belval Fund initiated the following year. The first building on the campus was completed in 2005, followed by the Biomedicine buildings in 2011. Further construction is planned, with new buildings to be opened in 2017 and beyond. The Maison du Savoir houses the campus's central administration. The Maison des Sciences Humaines is the new home of the humanities department, including language and literature, as well as the arts and education departments and the campus library (BiblioLab). And attendees to the inauguration were also able to see the technological experiments currently being undertaken at the Maison de l'Innovation. Also in attendance was Prime Minister Xavier Bettel and Minister of Infrastructure and Sustainable Development François Bausch. A few more photos at Wort, in addition to some more information about Belval at the university website. The move to Belval signals, in part, Luxembourg's ongoing efforts to redefine itself in an evolving world economy, so the university link makes for a very interesting read about the country's projected future. The Prime Minister of Bhutan, Tshering Togbay, is currently on a working visit to the Grand Duchy. In the early afternoon, he was received by Grand Duke Henri for an audience at the palais grand-ducal. And thinking of Bhutan, you know what I'd totally dig? 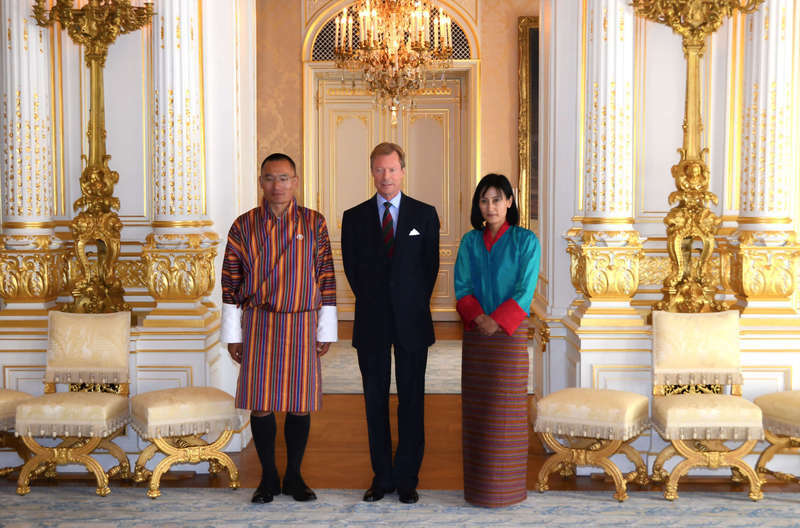 A state or an official visit between Bhutan and Luxembourg. Who wouldn't want to see the King and Queen of Bhutan in the Grand Duchy or the Grand Duke and Grand Duchess in the country of the dragon?! Where can I petition to make this happen? 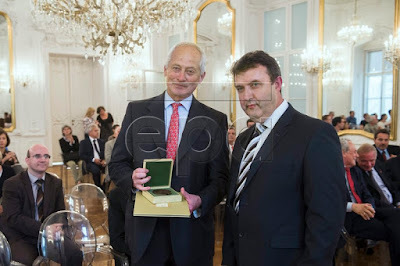 This past weekend, Prince Nikolaus was in Granada to attend the inaugural conference for the Institute of Philosophy Edith Stein, which is a sister organization to the Liechtenstein-based International Academy of Philosophy. The conference, entitled "Realist Phenomenology: Josef Seifert and the Christian Tradition" celebrated the 70th birthday of Austrian-born philosopher Josef Seifert, who has been a friend of Prince Nikolaus for several decades, as well as a friend of the late Pope John Paul II. The Congress, held at the Granada Diocesan Seminary, was opened by Mons. Javier Martinez, the Archbishop of Granada, and also featured the announced donation of a private library to the institute. 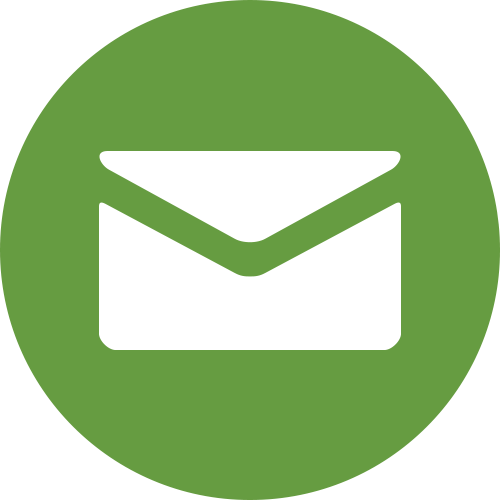 More information about the conference, as well as other attendees here. No photos of Prince Nikolaus at present, but they'll be added if any are made available. Once again the LGT Bank Austria was the main sponsor of the Vienna Masters, an international 5-star equestrian tournament, which took place near Vienna over the past few days. 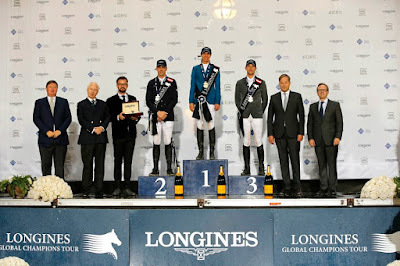 Prince Philipp was on hand for the victory ceremony of the "Longines Global Champions Tour Grand Prix of Vienna presented by LGT" won by Luciana Diniz. About the event Prince Philipp said, "I think it’s an amazing show here in Vienna. Year after year the show is great here and, today again, it was a pleasure to be here. Until the last moment, we didn’t know who would win which made it extremely exciting and it will be a very tight race until the last moment." Radio Liechtenstein, together with the Liechtenstein Red Cross, the Caritas and a local refugee aid association, had a fundraising day this week to collect donations for a soup kitchen in the Syrian town of Aleppo giving out 6,300 meals a day. The fundraising event was supported by Hereditary Princess Sophie in her capacity as President of the Red Cross and gathered some 100,000 Swiss francs plus additional donations made directly to the Red Cross and the Caritas. More information at Vaterland and Radio L.
It's time to vote again! But first, let's have a look back: It was a clear match this time. In a clear race from start to finish the Belgian Scroll Tiara won against Grand Duchess Maria Ana's (mystery) Tiara with 89.92 percent of your votes and thus advancing to the semi-finals. Voting closes on Wednesday night, don't forget to comment below. P.S. As I know some of you were interested what else I saw at the treasury of Munich's Residenz a few weeks ago apart from the tiaras featured in this race, check out Castles & Co for that! There are a few tiaras that have become unexpected contenders in the Luxarazzi Tiara Race. One of them is Princess Joan's Diamond Tiara, who has made it through to the quarter finals and become a bit of a dark horse. Owned by the former Princess Joan of Luxembourg, we sadly know nothing about the sparkler's history. Born in New York City as the daughter and heiress of U.S. Treasury Secretary Clarence Douglas Dillon, Joan Douglas Dillon was the first commoner to marry into the Grand Ducal Family - and a divorced American commoner at that. It wasn't an easy ride for her and her future husband Prince Charles, son of Grand Duchess Charlotte and Prince Félix, though. Joan moved to Europe during the early 1950's when her father became the U.S. ambassador to France. In Paris, she met fellow American James Brady Moseley who she married in 1953 and had a daughter with before divorcing two years later. In 1952, Joan had become a Catholic and as such an annulment of her marriage by the Vatican was necessary if she ever wanted to marry religiously again. That annulment was granted in 1963. At the time of her annulment, Joan had known and been in love with Prince Charles, younger brother of Grand Duke Jean, for a good five years. However Joan being both a commoner and a divorcée, Grand Duchess Charlotte first opposed their marriage. The couple finally tied the knot on March 10, 1967 in a small ceremony at the Roman Catholic Church of St. Edward the Confessor at Guildford, Surrey, attended by all his family. Six months later, the couple's first child, Princess Charlotte, was born. After their wedding, Prince Charles and Princess Joan moved to Luxembourg where they lived with Grand Duchess Charlotte and Prince Félix (as well as Charles' sister Elisabeth and her daughters) at the Château de Fischbach, a time described by their son, the occasionally featured Prince Robert, as a mini-Downton Abbey. Sadly, Prince Charles died in 1977 at the age of 49 due to heart failure while on holiday in Italy. A year later, Princess Joan married Prince Philippe de Noailles, 8th Duke de Mouchy, and thus ceased to be a member of the Grand Ducal Family and a Princess of Luxembourg. Instead she became the Duchess of Mouchy. During the ten years she was a member of the Grand Ducal Family, Princess Joan also represented Luxembourg at state occasions. For gala dinners she usually went for her own tiara. An all-diamond piece in a (presumably) flower-y design. A choice echoed by her daughter, Princess Charlotte (above, in the middle) for her 1993 wedding to Marc Cunningham. Where the tiara came from - Joan's family, who are the owners of one of the most famous French wines estates, her in-laws, or second husband - we do not know. I'm pretty sure though that it is still owned by her. At the time of the wedding of Hereditary Grand Duke Guillaume and Hereditary Grand Duchess Stéphanie in 2012, I saw a (n admittedly not very good) picture of what looked like Princess Charlotte wearing her mother's tiara for the gala dinner. A little more information about the audience at the Cour website. Prince Hans-Adam was awarded the Pro Cultura Hungarica plaque by the Hungarian Minister of State for Higher Education, László Palkovics. 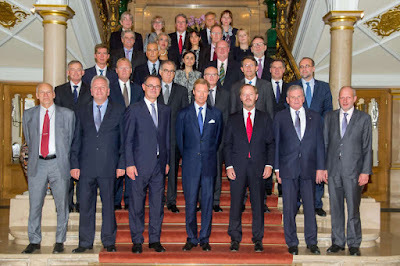 Liechtenstein's head of state was in Budapest for the presentation of his book, "The State in the Third Millenium", at the Andrássy University. Earlier this week, Princess Tessy visited the UNAIDS headquarters in Geneva to learn more about the AIDS epidemic as well as the work of UNAIDS. She visited together with staff members from the Luxembourg Institute of Health, who presented the work that the Grand Duchy is doing to end the AIDS epidemic. "We have to involve, empower and engage young people everywhere to ensure a bright and healthy future for generations to come", the wife of Prince Louis stated. Hear Tessy's words in this video. More pictures and information on the website of UNAIDS. 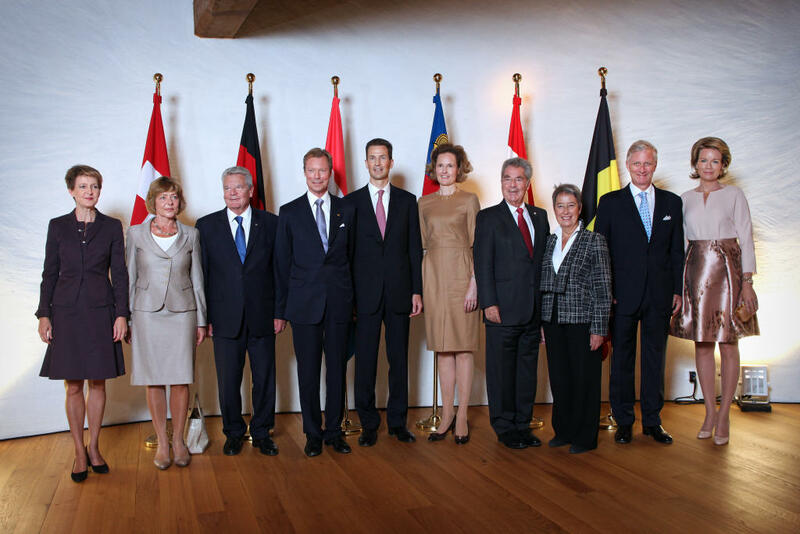 The German-speaking heads of states had their annual informal meeting in Vaduz today. German-speaking in the case doesn't man that one can speak Germany - sorry, Willem-Alexander, you are out - or that you have a German-speaking minority in your country - sorry, Margrethe, you are out, too - but that German is (one of) the official language(s) in your country. Those six countries are Germany, Austria, Switzerland, Liechtenstein, Belgium and Luxembourg. 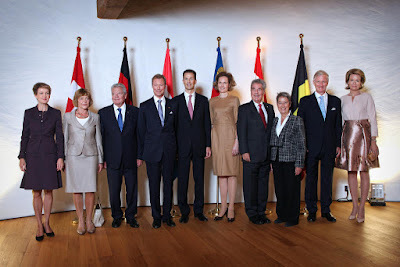 And so Hereditary Prince Alois and Hereditary Princess Sophie hosted German President Joachim Gauck and his partner, Austrian President Heinz Fischer and his wife, Swiss President Simonetta Sommeruga, King Philippe and Queen Mathilde of the Belgians as well as Grand Duke Henri in Vaduz today. No word why the Grand Duchess wasn't present for the event, which she also missed last year. 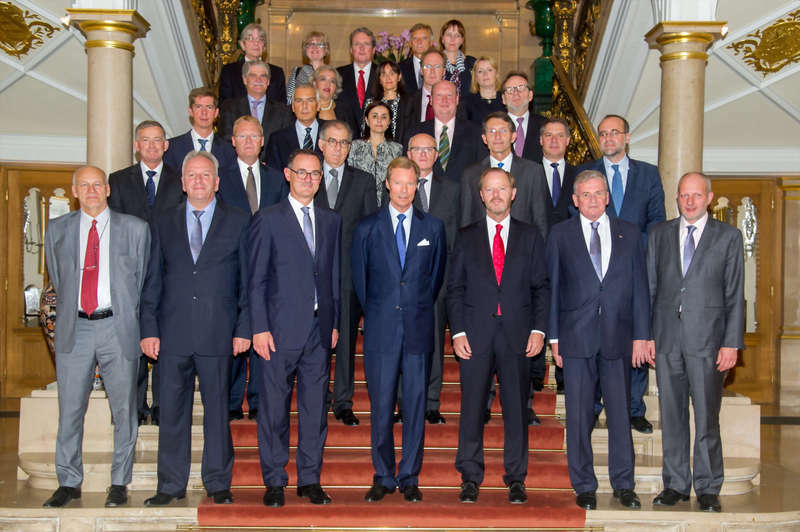 This year was the second time the heads of states of Luxembourg and Belgium joined the meeting as previously only the heads of state of the countries where German is spoken as the primary language by the majority of the population met. Topics discussed included the digital revolution of the economy and its consequences for the different nations as well as the current political situation, most importantly the refugee crisis. 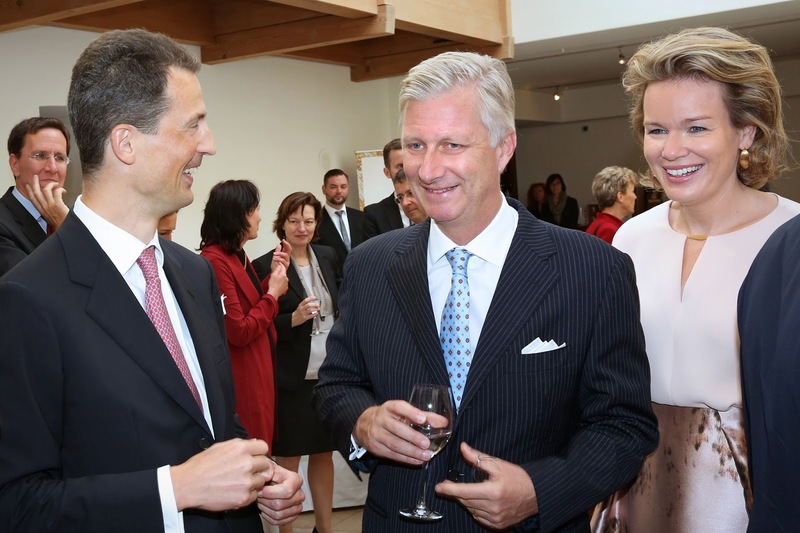 Hereditary Prince Alois announced that he will advocate for Liechtenstein to join the European Union's proposed relocation mechanism. While the official meeting of the heads of states took place, their partners paid a visit to the carpenters' workshop Frommelt in Schaan, who are known to build especially energy-efficient houses. 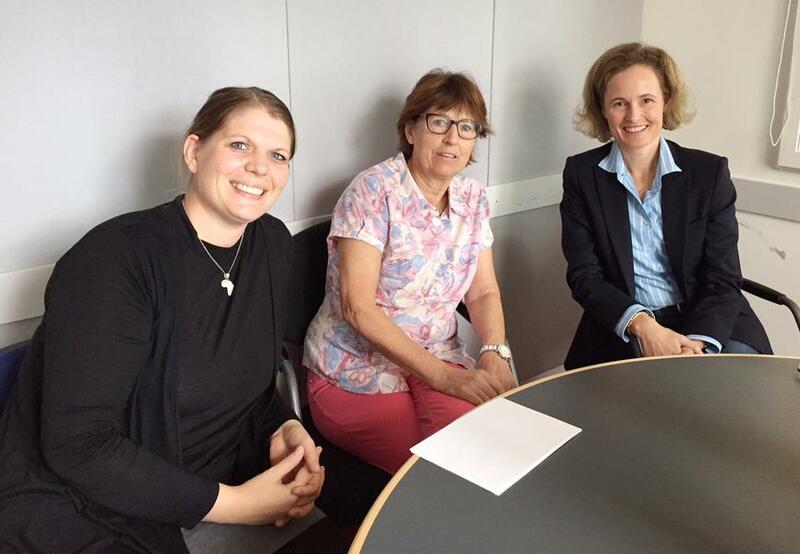 Hereditary Princess Sophie, Queen Mathilde, Daniela Schadt and Margit Fischer also visited the association Neues Lernen (new learning) in Vaduz. They are currently developing special language courses for refugees that will help them to learn everyday German more easily. After a joined luncheon at Schloss Vaduz, the heads of states and their partners visited the new part of the Kunstmuseum Liechtenstein as well as Schatzkammer treasury, where they saw the sparkly Ducal Hat. In addition, they also met members of Liechtenstein's government and parliament afterwards. In a press release Hereditary Prince Alois stated, "I would like to thank everyone who have made this successful meeting possible. For a small state like Liechtenstein good contacts and close relations with the nations who took part in this meeting a vitally important. This meetings have a special appeal. They bring together the heads of states of countries that are close to each other in many ways but are quite different at the same time when looking at their sizes, form of government and integration in Europe. Not least because of an exchange of opinion about the current political situation I value these meetings a lot." Next year's meeting will take place in Belgium for the first time. More pictures of the day at Vaterland, Volksblatt, Belga and EPA, for example. A video at 1 FL TV. It was a close race, it was the closest race - but in the end, one of them head to win. 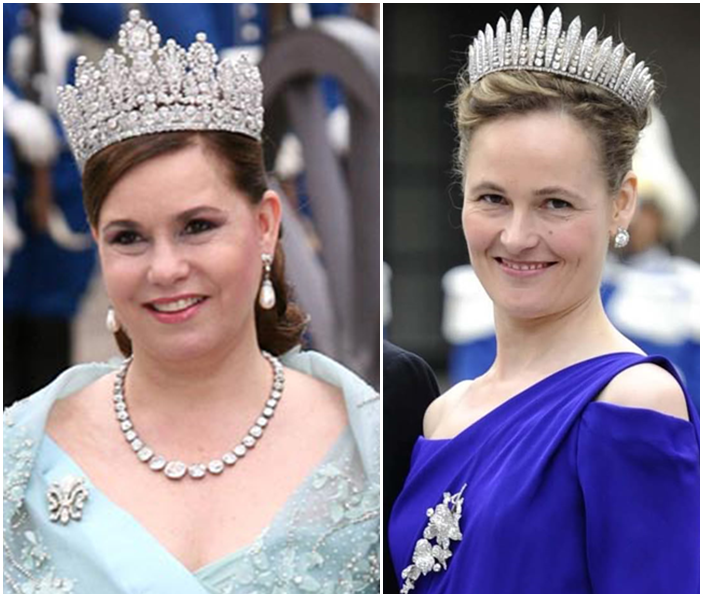 The Bavarian Lover's Knot Tiara and the Habsburg Fringe Tiara went head to head for all of the match. At one point the Bavarian sparkler led by two votes, at another the Liechtenstein tiara was ahead by three - and when we had 370 votes, we actually had a draw. 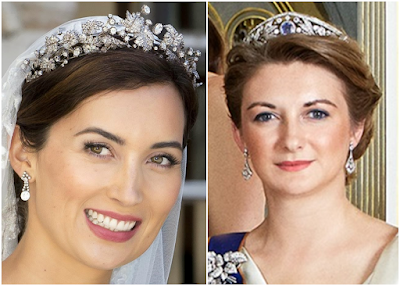 In the end, we even had a bit of a clear winner considering how close the race was: The Habsburg Fringe Tiara got 51.02 percent of your votes and thus advances to the quarter finals of the Luxarazzi Tiara Race! Voting closes on Saturday night. Don't forget to explain your decision below! 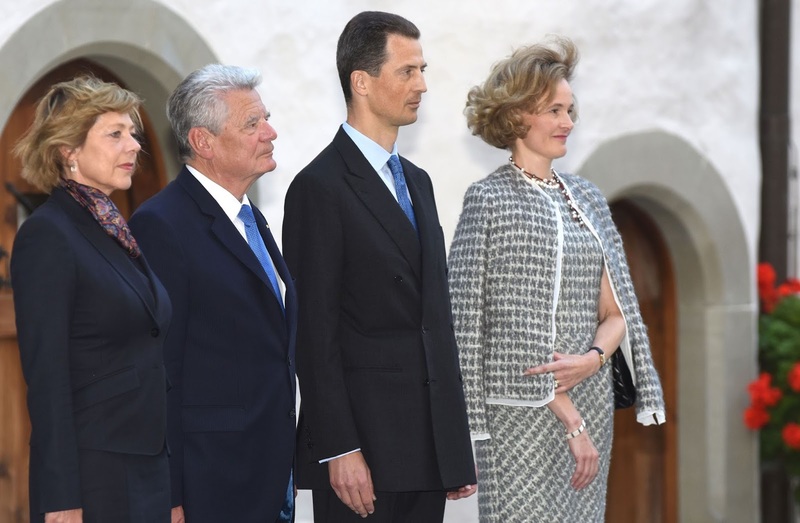 Hereditary Prince Alois and Hereditary Princess Sophie received German President Joachim Gauck and his partner Daniela Schadt at Schloss Vaduz today. During the afternoon hours, the Hereditary Prince and the German head of state held bilateral talks before before Mr. Gauck and his partner visited the company Hoval. Afterwards, they had dinner together with the Hereditary Princely Couple. More pictures and information at Volksblatt and Vaterland, a video at 1 FL TV. 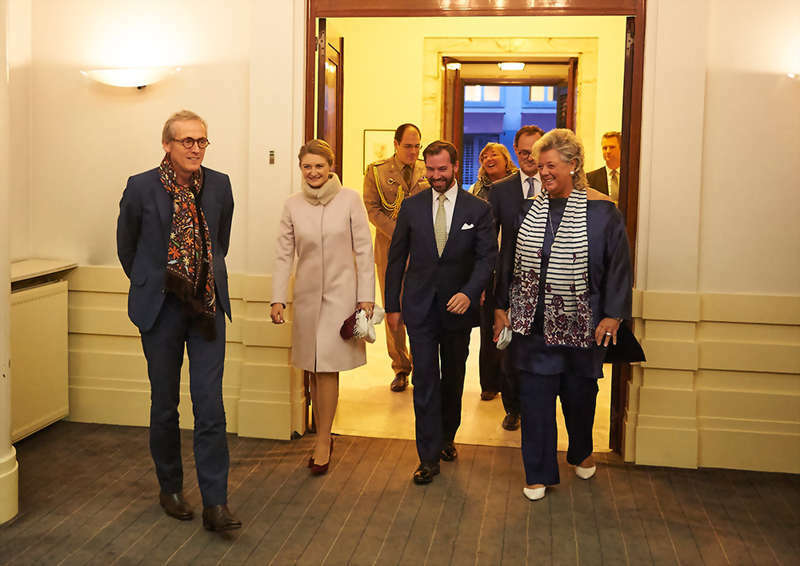 On Thursday last week, Liechtenstein ambassador to Austria, Princess Maria-Pia, hosted the traditional Liechtenstein reception at the Gartenpalais in Vienna. 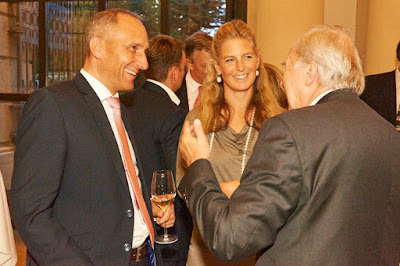 Among its guests were Prime Minister Adrian Hasler as well as Princess Tatjana, only daughter of Prince Hans-Adam (both pictured above). The Principality and its eastern neighbour share numerous diplomatic and contractual ties. 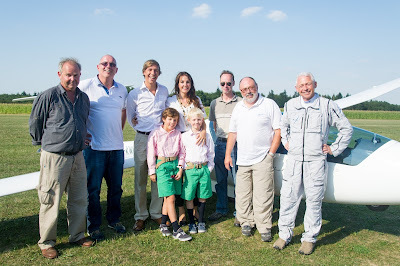 It's rather likely that other Austria-based members of the Princely Family, such as Prince Constantin and Princess Marie, were also present for the event. Kind of unexpected but very much welcomed, the Norwegian Royal Court has released a picture of all those royals attending the much talked about summer gathering hosted by Crown Prince Haakon and Crown Princess Mette-Marit at Mågerø, the Norwegian Royal Family's private holiday retreat situated on a headland in Tjøme in southern Norway. Apart from Hereditary Grand Duke Guillaume and Hereditary Grand Duchess Stéphanie, the Crown Prince and Crown Princess were also joined by their children, Princess Ingrid Alexandra and Prince Sverre Magnus, Crown Princess Victoria and Princess Estelle of Sweden, as well as Crown Prince Frederik and Crown Princess Mary of Denmark with their children Prince Christian, Princess Isabella, Prince Vincent and Princess Josephine. Previously on the Luxarazzi Tiara Race: The Lannoy Tiara did put up a good fight but in the end it was no match for the Empire Tiara. The sparkler that puts the grand into the Grand Duchess gathered 64.02 percent of your votes and thus advances to our quarter finals. don't forget to drop us a comment below why you chose the tiara you did! 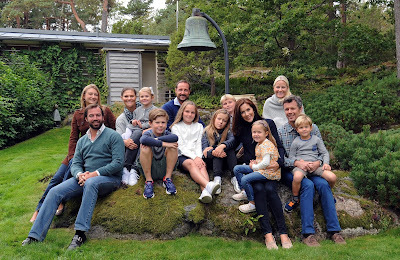 As reported last night, Hereditary Grand Duke Guillaume and Hereditary Grand Duchess Stéphanie are in Norway this weekend, where they will attend a (presumably private) summer party at the cabin of the Crown Prince and Crown Princess of Norway. To get there, they arrived at the station of Drammen via train yesterday afternoon and then proceeded via car to Mågerø, the Norwegian Royal Family's private holiday retreat situated on a headland in Tjøme in southern Norway. 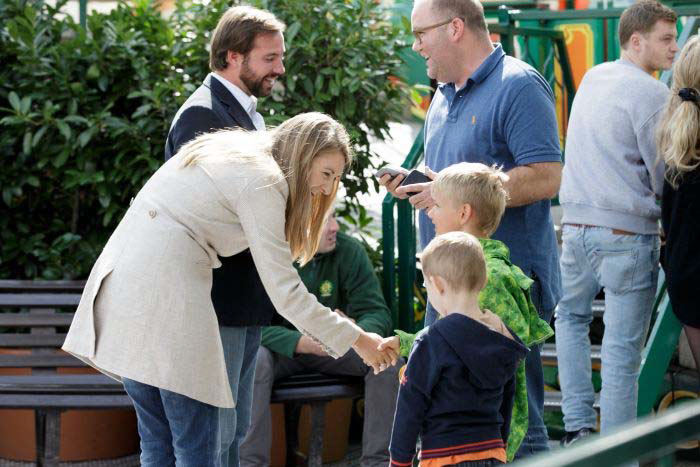 A few pictures of Guillaume and Stéphanie at Drammen over at the local paper, Drammens Tidende. 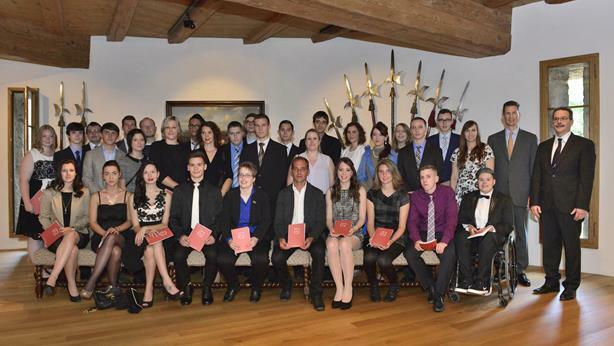 Today, Prince Alois hosted 33 young graduate apprentices at Schloss Vaduz. These young men and women are the highest achieving apprentice graduates of the year. They received a guided tour of the castle before being given their diplomas by Prince Alois. After receiving their diplomas they had the honor of signing the castle's Golden Book (those large elaborate books you always see dignitaries signing when they pay official visits to countries, towns and historic buildings). It is a long standing tradition that the highest achieving students completing the apprentice program in the Principality are received at the castle where they are presented their diplomas and add their names to the Golden Book. No news for a few weeks and now three in a day: Norwegian website VG reports that Hereditary Grand Duke Guillaume and Hereditary Grand Duchess Stéphanie will be in Norway this weekend where they are supposed to attend a summer party hosted by Crown Prince Haakon and Crown Princess Mette-Marit of Norway. The party will take place at the royal summer house on the island of Tjøme in the south of the Scandinavian country. Other guests include Crown Princess Victoria of Sweden and her daughter Princess Estelle. Who would have thought back when we first introduced the Princely Family here on Luxarazzi that Princess Theodora would be one of the most featured members of the extended family?! 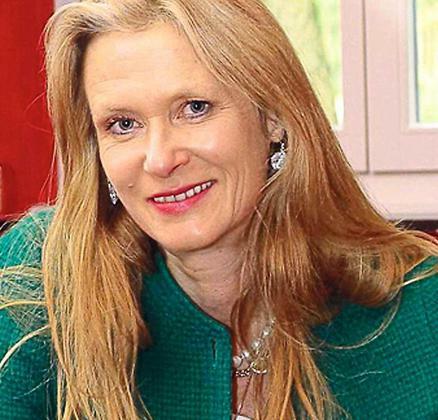 The daughter of Prince Alexander and Princess Astrid and granddaughter of Prince Philipp launched the Green Teen Team, a foundation whose aim is to involve children and teens in wildlife preservation, back in June of last year. Last weekend she was out and about in Italy with her father where she released a turtle named "Drago" back into the wild again. More information, pictures and videos at Verona Economia, TV 7 and Corriere della Sera. 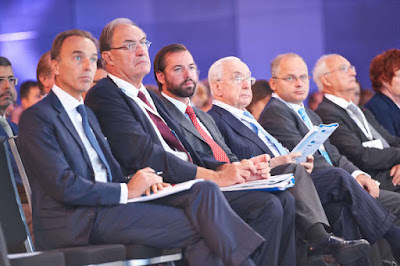 After his father received both the president and secretary general of Eurofi, a European thinktank dedicated to financial regulation and supervision, on Wednesday, Hereditary Grand Duke Guillaume attended the Eurofi Financial Forum on Thursday. Organised in association with the Luxembourg presidency of theh EU Council, the conference dealt with the topic of "EU and Eurozone growth initiatives: the moment of truth?" The aim of the forum was to host open and interactive discussions between public decision-makers and leaders of the financial industry on the major on-going reforms in the financial sector. A few more visuals over on the website of the cour. 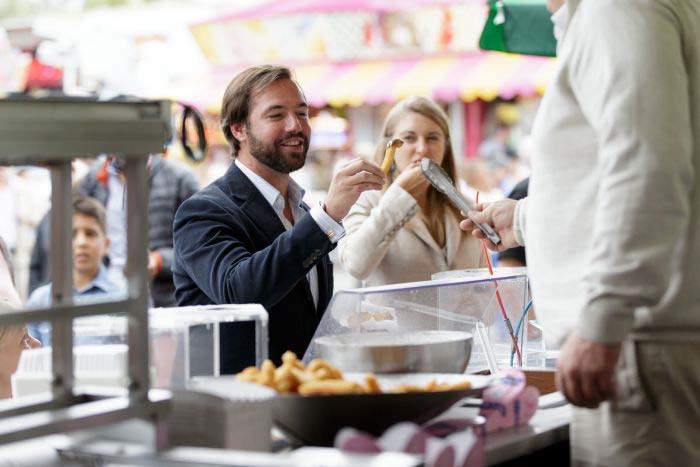 Last Wednesday, Hereditary Grand Duke Guillaume and Hereditary Grand Duchess Stéphanie made a private visit to the Schueberfouer. 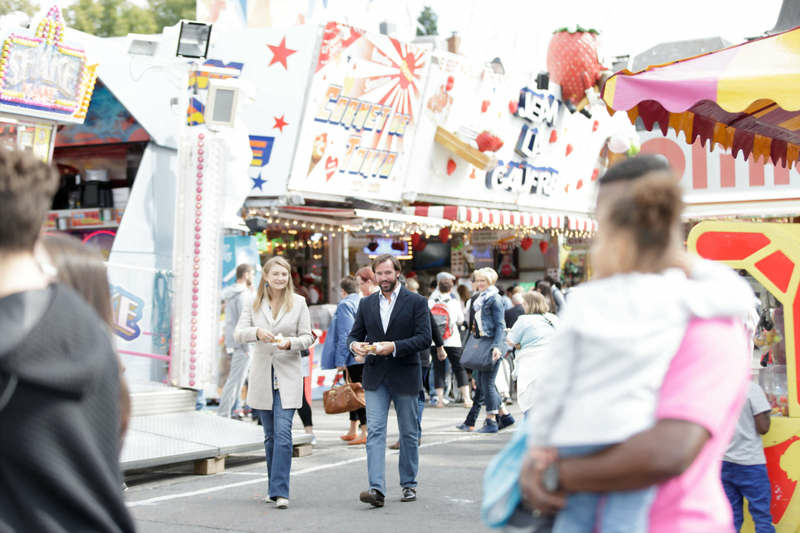 The funfair on the Glacis Square is considered to be one of the oldest of its kind, this year being the fair's 675th edition. 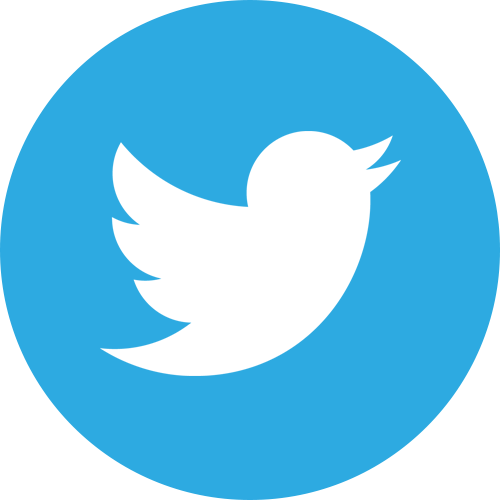 (Yes, it goes all the way back to John the Blind, King of Bohemia and Count of Luxembourg and is thus reason enough to soon have an entirely own Luxarazzi 101 dedicated to it.) 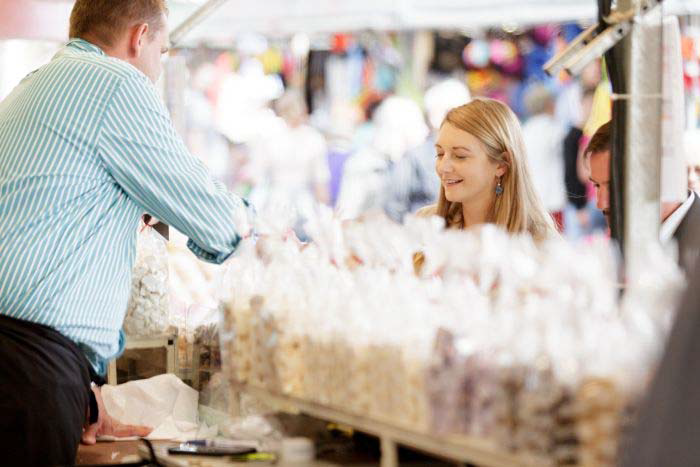 At the Schueberfouer, Guillaume and Stephanie did what one does at a funfair: Mingled with the other visitors, tried some food and took some of the rides. A few visuals of the private visit were released by the cour grand-ducale. Time to make up for one of the biggest shames of the Luxarazzi Tiara Race. 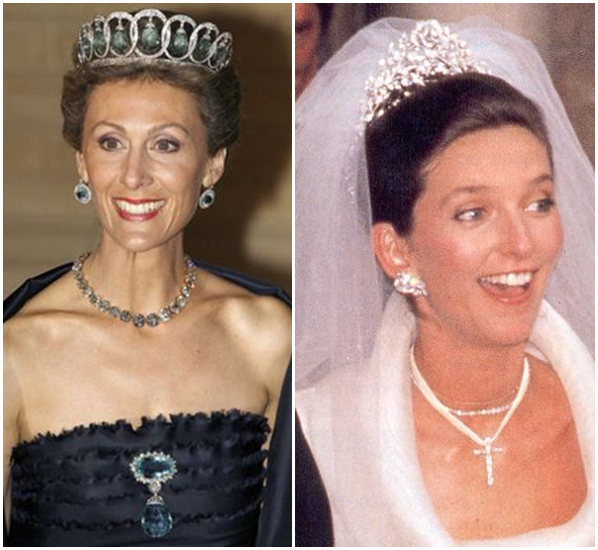 The shame that we do not have a post focusing on the Aquamarine Bandeau Tiara, which advanced to the second round but lost against the Grand Duchess Adélaïde Tiara there. 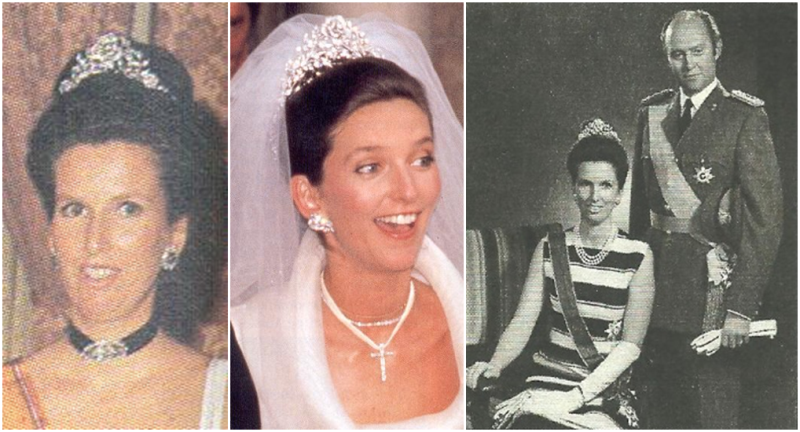 Truth be told, the reason why we did not have a post about the only aquamarine tiara of the Grand Ducal Family - not counting Queen Ena's Aquamarine Tiara here for the obvious reason that it is owned by the mother of Princess Sibilla - is that there isn't a whole lot information available. 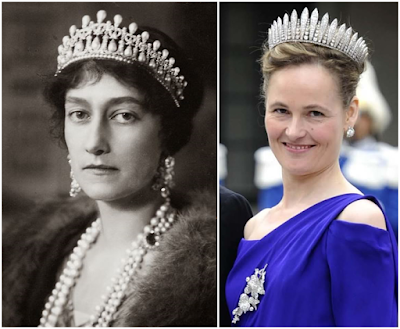 Commonly believed to have been made for Grand Duchess Joséphine-Charlotte, the tiara features five rectangular aquamarines interspersed with a diamond knot motif. Set in an art deco style, the tiara is part of a demi-parure also featuring earrings and a necklace. As its name suggests, the Aquamarine Bandeau Tiara was originally supposed to be worn bandeau-style across the forehead. However, as this style isn't very common anymore, it has slowly made its way on top of the heads of the Grand Ducal Family. 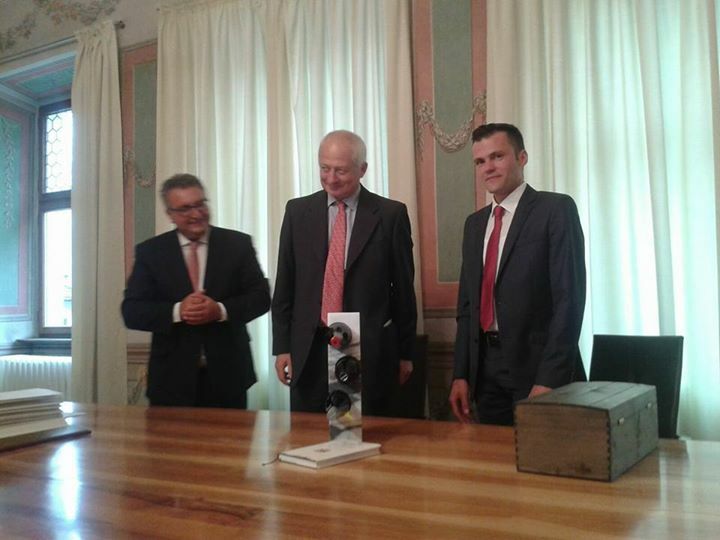 On Wednesday, Hereditary Prince Alois received Austrian Finance Minister Hans Jörg Schelling at Schloss Vaduz. 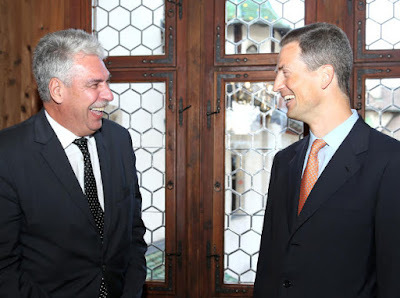 Schelling, who has held the office since September of 2014, is on a brief visit to Liechtenstein and also met with Prime Minister Adrian Hasler for what was described as an "informal conversation." You decided, Team Sapphire - or Team Adélaïde - it is! 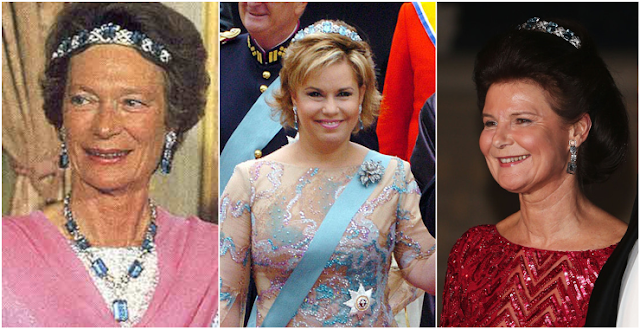 With a whopping 85.52 percent of votes, the Grand Duchess Adélaïde Tiara won against the Aquamarine Bandeau Tiara. Today, we again ask you which team you are on, 'Team Big' or 'Team Small'? Representing 'Team Big' is the tiara that puts the 'grand' in Grand Duchess - the Empire Tiara. 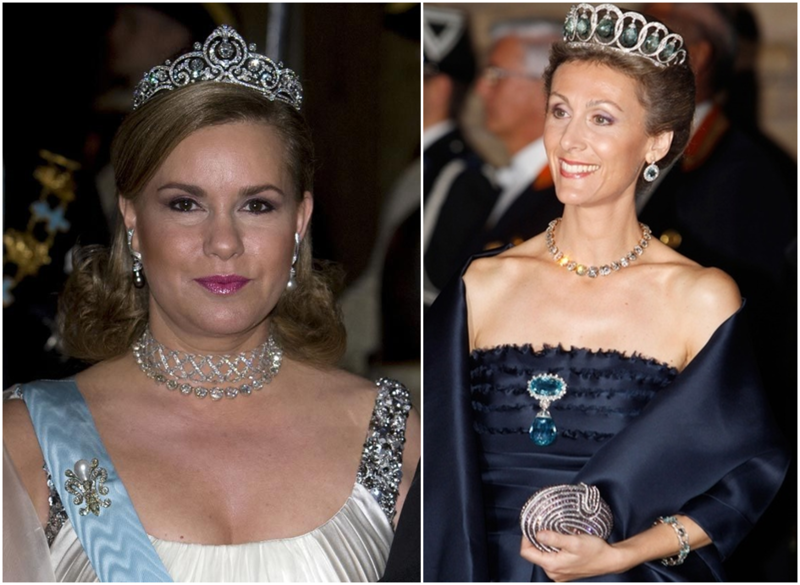 Competing for your affection against the biggest sparkler in the Grand Ducal Collection is the Lannoy Tiara for 'Team Small'. So, does size really matter? Tell us, are you on 'Team Go Big or Go Home' or rather 'Team Small But Beautiful'? Don't forget to tell us your choice below! Grand Duke Henri had not one but two (or possibly a few more) audiences today. 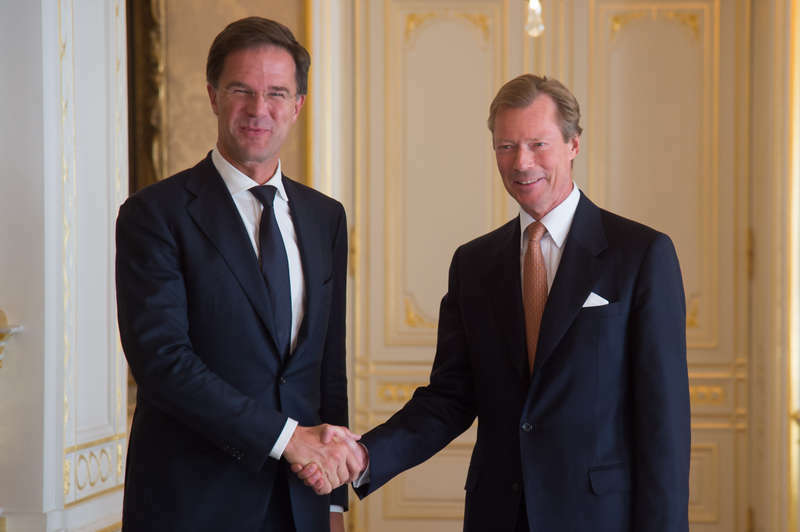 He received both Dutch Prime Minister, Mark Rutte, as well as Jacques de Larosière and Didier Cahen, president and secretary general respectively of Eurofi, a European thinktank dedicated to financial regulation and supervision, at the palais. 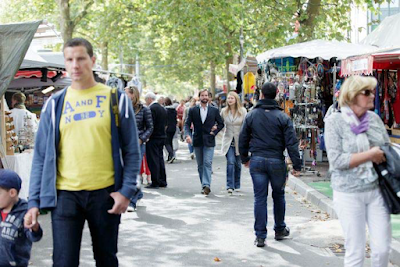 More infos and pictures of the audiences on the website of the cour, here and here. Pierre Bley will resign as Maréchal de la Cour at the end of this year as RTL found out and Wort confirmed. The resignation came as a surprise to many but Monsieur Bley told Wort that the decision has been in the works for some time. Nothing is known yet who will follow him in his role as Court Marshall. Pierre Bley took over the highest office of the cour in September 2013 from Pierre Mores. On Saturday, Prince Hans-Adam was in Vinschgau (South Tyrol) to present his book The State in the Third Millennium. 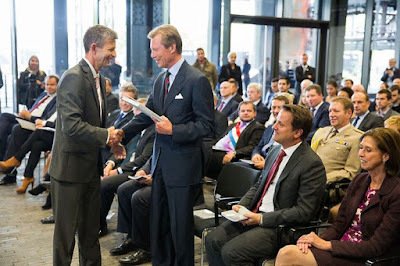 Apparently, it was a packed house, with several hundred attendees, at the local civic center Karl Schönherr for Prince Hans-Adam's presentation. A few more photos at the Schlanders Marketing Facebook page, and a video of Prince Hans-Adam discussing the book at Stol.it. Also, a more personal take on the event at this blog.